The Department for Transport bypassed key procurement oversight processes as it signed off the now cancelled £13.8m Seaborne Freight shipping contract, Transport Network can reveal. The DfT said that it had decided to terminate the contract after Arklow Shipping, which had backed Seaborne Freight, had pulled out. The deal was the subject of controversy when it was revealed Seaborne Freight, which was supposed to be a backup plan in the event of a no-deal Brexit, had no ships and had copied its terms and conditions from what appeared to be a takeaway delivery outfit. Hours before the termination was announced Transport Network approached the DfT for comment on what appear to be shortcuts in the procurement oversight process and due diligence behind the deal. An FOI request from Transport Network revealed that: 'A maritime subgroup of the Board of Investment and Commercial Committee reviewed all bids submitted as part of the department's additional freight capacity procurement including that by Seaborne Freight. This means the deal was effectively signed off by a subgroup of a subgroup and the main form of oversight - the Procurement Assurance Board - where the contract would have received scrutiny from a senior panel including experts and lawyers, never looked at the deal. These procedures were put in place following the mistakes in the West Coast Mainline debacle, which it is estimated cost the department at least £50m. A DfT spokeswoman said: 'Following the decision of Seaborne Freight’s backer, Arklow Shipping, to step back from the deal, it became clear Seaborne would not reach its contractual requirements with the government. We have therefore decided to terminate our agreement. The Department has yet to respond to Transport Network's request for comment on the procurement process but has said Seaborne Freight will receive no payments. This does not mean the deal came at no expense to the government. 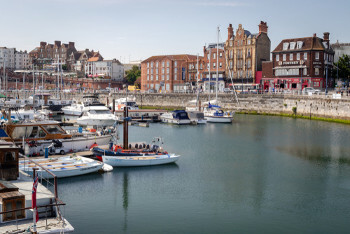 It was also revealed that transport secretary Chris Grayling contacted Thanet District Council, owner of Ramsgate Port (pictured), where Seaborne was due to operate from - asking it to postpone a budget that would have shut down parts of the port for use by freight shipping. The port has not been home to commercial freight operations since 2013, when the last company that operated there collapsed leaving the council with a multi-million bill. According to reports, keeping the site open is costing local taxpayers £7,224 a day. The council has also spent money and time arranging for potential operations. Andy McDonald MP, the shadow transport secretary, said the cancellation had been foreseen by his party and could not go without consequence. Jeremy Corbyn said Chris Grayling claimed the Government had ‘looked very carefully’ at Seaborne Freight 'before giving the company the contract, but apparently not carefully enough to notice that it didn’t have any ships. Chris Grayling does have form in other departments'. The original contract was tendered behind closed doors using the excluse - criticised by some in parliament - that there was exceptional and 'unforseeable' circumstances - despite the possibility of a no deal Brexit being known for more than a year prior. It remains to be seen whether the DfT will claim the failure of Seaborne Freight was unforseeable.